EXTRA LONG BATTERY LIFE: 1500mAh super large capacity. Lasts an impressive 72 hours of LED fill light time, 30 hours of Bluetooth connection time or 3 years of standby time. 270 DEGREE ADJUSTABLE HEAD: The mount at the top of the selfie stick can be positioned at different point, allowing you to find the best shoot angle. The postpositional reflector helps you better use rear camera. 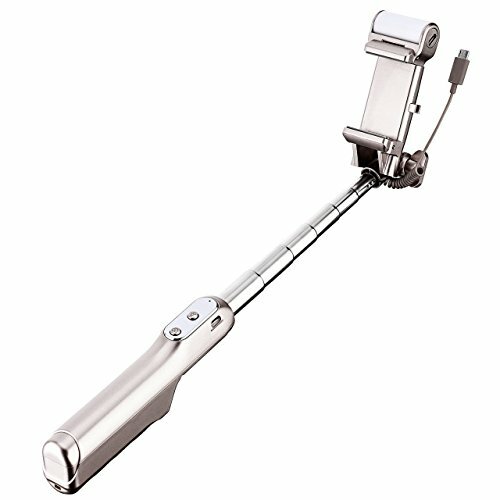 LIGHT AND PORTABLE: 181g, 7.3in (shortest)--33.9 (longest), the extendable and foldable design makes the selfie stick easy to carry. A cloth bag is provided, easy to put into your pocket or handbag. "EXTENDABLE PHONE HOLDER: Firmly supports device width between 1.8-3.3inches and rod length between 7.5-33.9inches, suitable for iPhoneX/8/8P/7/7P/6s/6, which supports iOS 5.0 or above, Android 4.2 or above or HTC and other smartphones. "